Those ominous words open Owen D. Pomery’s latest comic The Victory Motel – debuting this weekend at the inaugural South London Comic and Zine Fair – and seem to rather neatly encapsulate the weary existentialism of so much of his work in one cynically profound soundbite. 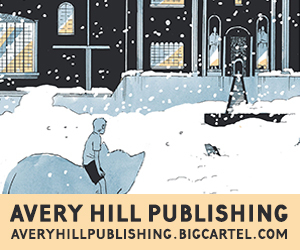 Pomery began his route into comics through self-publishing before becoming one of the staple components of the Avery Hill Publishing creative machine via The Megatherium Club, Reads and his acclaimed Between the Billboards. His work ranges from outrageous slapstick to dark drama but throughout his comics to date there’s been a sense of pragmatic resignation about life’s caprices, whether that be in the predictable excesses of his drunken 19th century scientific explorers in the aforementioned ranks of the Megatherium Club or the extreme societal withdrawal of the reclusive James Ebner in Between the Billboards. 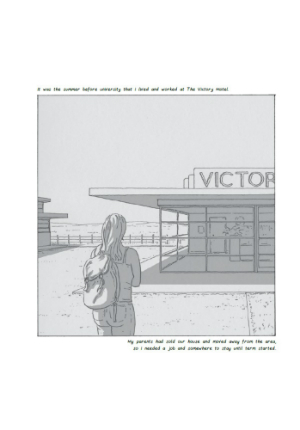 The Victory Motel is a collection of five interconnected short stories taking place in the locale of the comic’s title over the course of a day and giving us transitory but revealing glimpses into the worlds of those who book into its environs. Each tale is a brief vignette that tells us very little about them and yet, simultaneously, also tells us everything we need to know about their lives – from the solitary travelling businessman, to the inextricably linked lovers meeting for their annual liaison, through to the couple whose distance from each is carried in every aspect of their body language. Employing his ever keen eye for the architectural and his innate understanding of the psychogeographical, Pomery exploits the spaces his characters inhabit to subtly emphasise the thematic heart of each tale; not just in terms of narrative location but also from the perspective of the construction of the panels they move through. The slow panel-to-panel build in the first segment ‘Everything is Fine’, for example, as the minutiae of the businessman’s almost ritualistic approach to settling himself into his room evokes a sense of stifling and empty routine so reflective of its subject matter. Or the feeling of the immediacy of the moment in the second story ‘Arrangements’ (above) as time-jumping close-ups bring us into moments of intimacy that nevertheless will seem strangely detached as the pages progress. 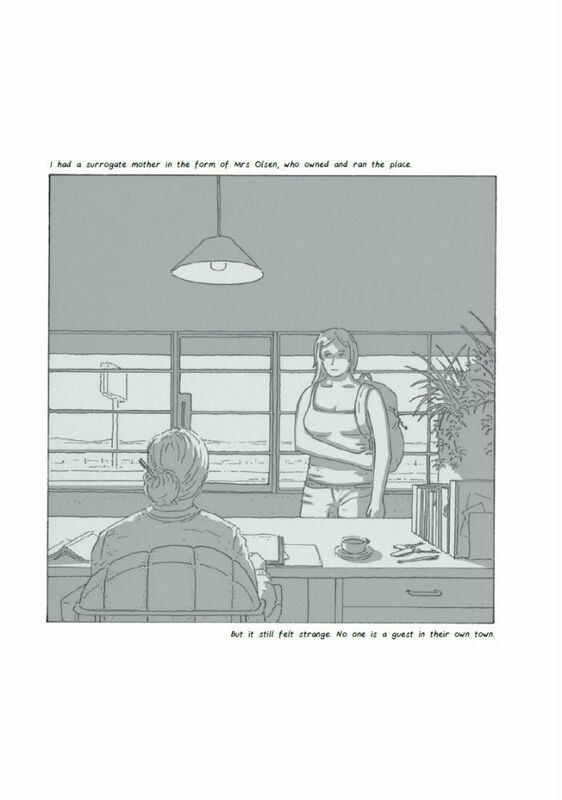 It’s also very much in evidence again in the leaps in time between single-page panels in the final story ‘I Am Here’ (below) that brings everything full circle in its study of a former motel employee. Visual characterisation plays an equally vital role in the atmosphere of The Victory Motel. 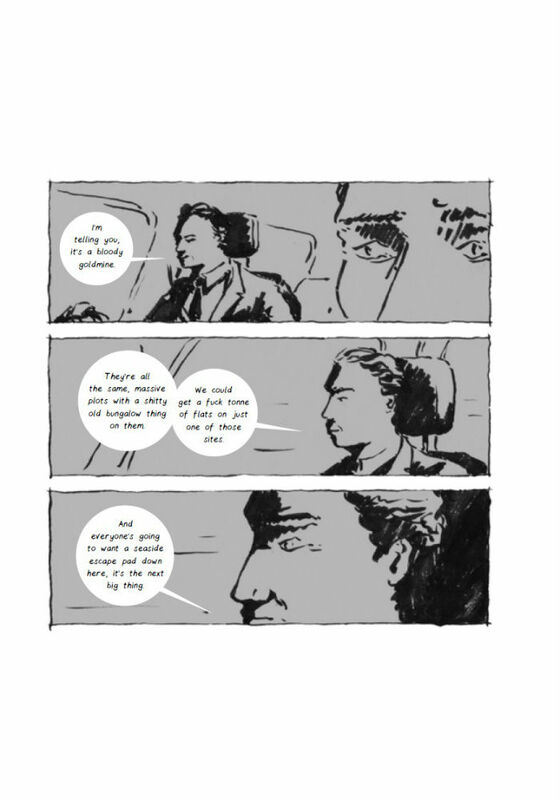 In the fourth story ‘Big Till’ (below right) the shady real estate dealings of two colleagues on the road result in very different reactions from both, as casual smugness and a sense of quiet shame are effectively juxtaposed by Pomery in terms of both the positioning of characters within individual images and facial expression. 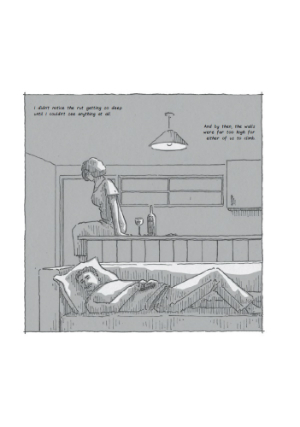 It’s never bettered here than in ‘Not Even’ (below left) as we almost inhabit a couple who seem so adrift of each other that they have sucked the very life out of one another. 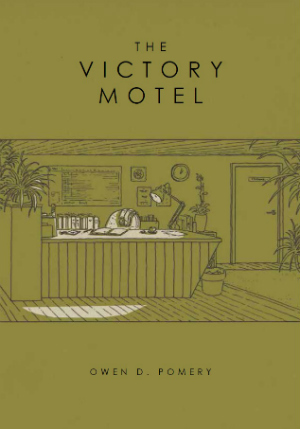 The Victory Motel is a book that is ripe for those wanting to take their own meaning from its interiors, whether that be from each separate section or from the tangentially interlocking nature of its incremental narrative. Pomery’s decision to illustrate every story in a slightly different style is enhanced by often dramatic shifts in pacing in each instalment, giving the audience a sensation of being immersed in very different (yet tangentially linked) existences. For more on Owen D. Pomery’s work check out his site here and follow him on Twitter here. 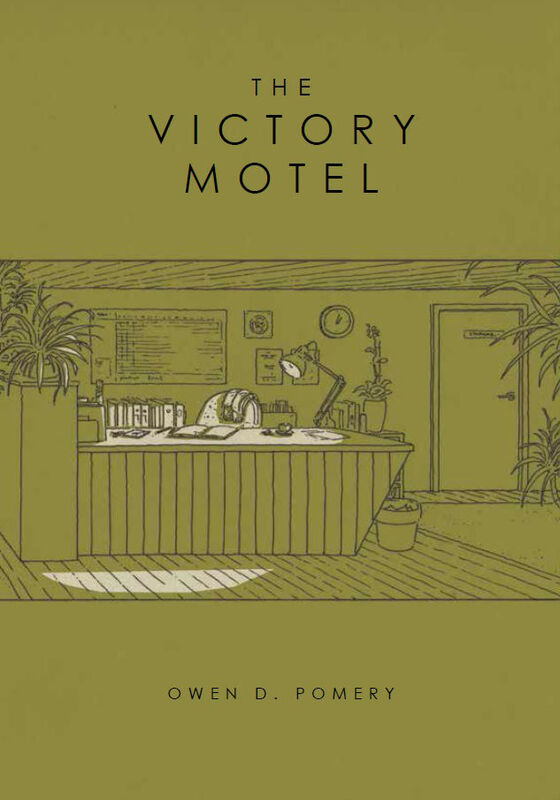 You can buy The Victory Motel online here priced £8.00.